Undaunted by the motorbike crash in 1993 that caused him to break his neck and left him tetraplegic, Sean Allerton, 53, is determined to make light work of his disability by raising money for the charities that have made a difference to his life. Following the crash, Sean received a grant from the RAF Charitable Trust, enabling him to undertake a flying scholarship facilitated by Flying Scholarships for Disabled People (FSDP). Sean said: "My scholarship from FSDP was funded by the RAF Charitable Trust. The scholarship enabled me to do something for me again and I am grateful to them for that. "I can't put the flying scholarship into words. I couldn't believe that they would let me loose in an airplane!" 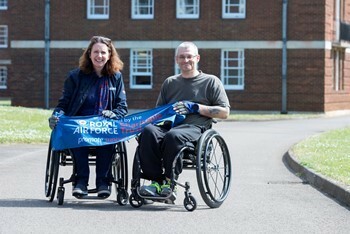 Since 2012, the former gunner has raised over £35,000 for the RAF Charitable Trust, RAF Association, RAF Benevolent Fund and Elizabeth's Legacy of Hope, through his Push500 challenge. "Being physically, and thanks to the chosen charities now mentally, in a place where I can give back a little bit, I wanted to raise awareness and money for those charities." Inspired by The Proclaimers' song, the challenge began as personal mission to push himself in his wheelchair for 500 miles. "The Proclaimers did not hesitate in supporting me - not only did they accompany me during the first two miles, but they gave an exclusive 20 minute concert. They're really nice gentlemen." Despite initially pushing for two miles at a time, the challenge has since escalated into marathon distances and 24 hour pushes and has racked up nearly 2,000 miles to date - the longest distance being 64.25 miles. "I will never be able to raise enough money, which is why I haven't set myself a target. When you set a goal you can easily fall short - this way, I can continue to raise money for the rest of my life." However despite his powerful story, the main reason for Sean's mission is not to inspire. "All I am doing is proving that if you put effort in, you will achieve great results - disability or not. "I have experienced blood, sweat and tears but also a feeling from helping others that you cannot buy." You can donate to Sean's Push500 challenge online at virginmoneygiving.com/push500.